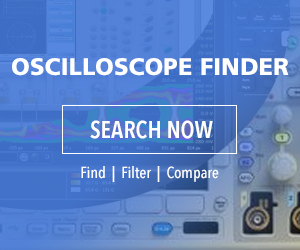 The 6 Series MSO mixed signal oscilloscope extends the performance threshold of midrange oscilloscopes to 8 GHz and delivers a 25 GS/sec sample rate simultaneously on all four channels – an industry first for this class of oscilloscope. Designers can accurately now view up to four high-speed signals at one time. For example, a DDR3 clock and three DDR3 data channels can be viewed and analyzed simultaneously, cutting the time it takes to fully characterize a design with an instrument that shares sampling systems between channels. The new 6 Series MSO also boosts measurement confidence with its low-noise inputs especially at the highest sensitivity settings. For example, modern embedded designs require clean, precisely-controlled dc power supplies to feed ASIC and FPGA devices. For such applications, the 6 Series MSO enables designers to measure dc power rails with more resolution and accuracy, reducing the time it takes to understand high-frequency influencers on power rails in a design. Based on the same breakthrough platform as the popular 5 Series MSO, the 6 Series MSO provides easy upgradeability for long-term investment protection. The 5 Series carryovers to the 6 Series MSO include a remarkably intuitive user interface, a capacitive pinch-zoom-swipe 15.6-in. touchscreen, innovative FlexChannel inputs, a 12-bit ADC that can deliver up to 16 bits of vertical resolution, a completely new industrial design, and optional Windows 10 operating system. To meet the need for more insight on faster signals, the 6 Series MSO incorporates a new low-noise preamplifier ASIC, the TEK061, that dramatically lowers noise, especially on signals that are in the hundreds of millivolts peak-to-peak. With its 25 GS/sec sample rate on four channels, the instrument delivers 16-bit resolution at 200 MHz when using the High Res mode. This means that not only can designers see the interfering signals on their power rail, but they can measure them with a level of accuracy, that until now has not been possible on a scope. Additionally, the TAP4000 and TDP4000 probes extend the range of Tektronix’ active, single-ended and differential probes, respectively, and now support up to 4 GHz bandwidth. The 6 Series MSO is available for order now with global shipments planned for Fall of 2018. Pricing starts at $23,500 US MSRP for 1-GHz models. The new probes, which will have similar availability, are priced from $6,000 US MSRP.